• Christmas is looming and snow and ice have been besieging London. 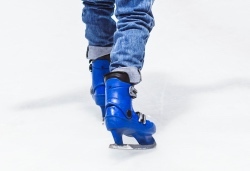 But there’s plenty you can do to keep warm, including visiting one of the many ice skating venues about the city. 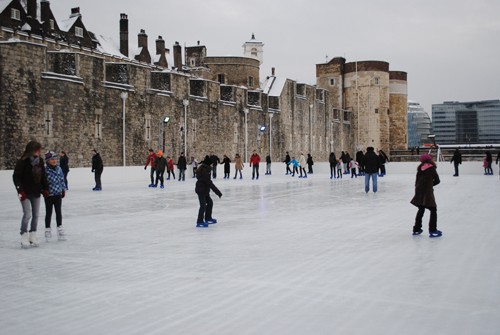 Among those with a particularly historic location are rinks at Hampton Court (located against the backdrop of the palace’s west front, it’s open until 9th January – see website for ticket prices and times), in the moat of the Tower of London (also open until 9th January, see website for ticket prices and times), and at Somerset House (open until 23rd January, see website for ticket prices and times). • The British Military Tournament 2010 will be held at Earl’s Court this weekend. The programme features 500 troops, 145 horses, military bands, the field gun run and will include a re-enactment of a combat incident in Afghanistan involving recently returned troops. Presented by ABF The Soldiers’ Charity, with performances on both Saturday and Sunday. For more information – including booking information, see www.britishmilitarytournament.com. • New blue plaques have been unveiled in London marking the former homes of speed daredevils Sir Malcolm Campbell and his son Donald, and ground-breaking photographer Bill Brandt. The plaque for the Campbells, who between them set 10 land speed records and 11 water speed records, is located at Canbury School in Kingston-upon-Thames – Sir Malcolm moved here in 1919, married to Dorothy Whittall the following year, and, Donald was born here in 1921. The family moved in 1922 to Surrey. The plaque for German-born Brandt, meanwhile, was unveiled at 4 Airlie Gardens in Campden Hill. He lived here with his second wife Marjorie Beckett from 1958 and family members still live in the home. Some of his nudes were taken inside. For more information, visit www.english-heritage.org.uk.